The most common symptoms of Alzheimer’s disease are memory loss and forgetfulness, but there are many other effects for people with this form of dementia, and one of the most neglected issues is sundowning disorder. Sundowning refers to a state of restlessness, confusion or irritability that occurs in the late afternoon and early evening, typically around dinner time. During this time of day, it can be difficult to get a senior to go to bed or simply sit still. Not only that, it can be a source of great frustration and exhaustion to people caring for someone with Alzheimer’s. But learning more about sundowning disorder can help you cope with the situation. And the results of light therapy are gaining recognition. Why do people with Alzheimer’s experience sundowning? It’s well known that seniors with Alzheimer’s become increasingly restless as the sunlight fades, but the exact science behind this is still somewhat of a mystery. Many researchers believe that it is caused by changes in the brain related to Alzheimer’s that throw off the biological clock and puzzle the circadian rhythm. There are also other factors that can potentially lead to sundowning. Depression, for example, can lead to trouble sleeping that may cause one to become agitated and anxious when other people are typically calming down for the evening. Excessive thirst or other unmet physical needs may cause one to become irritable, and can cause pain or simple boredom. There are many ways a caregiver can help seniors find calm when sundowning sets in. Recognize the signs: The first step is to recognize the signs by being particularly attentive in the late afternoons and early evenings, and keeping an eye out for pacing, yelling and other signs of enhanced agitation. Listen: It’s important to listen to the senior calmly and understand his or her frustrations. You might find that your parent is hungry, has a bothersome ache or is experiencing another issue. Some discover that the issue causing the irritable behavior is easy to resolve. If this doesn’t help ease the symptoms of sundowning, there are other small things that can be done to make the senior’s environment more conducive to relaxation and tranquility. Quiet Time: Try to make early evening a quiet time by playing soft music and using gentle lighting that minimizes shadows. Reduce any clutter and noise that may serve as an irritant. Distraction: Keep an agitated senior distracted with a favorite activity such as solving a crossword puzzle or even a simple task like doing the dishes or folding towels. Having purpose and making a contribution in the household can result in loved ones feel needed and appreciated. Preventing sundowning from occurring in the first place is the best option. One of the many unique aspects of Alzheimer’s care at Aegis Living is Life Enhancing Light Therapy, which was tested at the Aegis Living of Bellevue, Washington, by Dr. Claudia Finkelstein, clinical associate professor at the University of Washington School of Medicine. Developed to diminish the effects of dementia and depression, this technique also helps ward off sundowning. The concept behind the strategy is that daily exposure to specific spectrums of light has the capacity to reduce anxiety and agitation. High-intensity track lighting exposes individuals to rays during breakfast and the early afternoon, simulating sunlight to keep seniors’ circadian rhythms in check. Each light provides residents with between 2,000 and 4,000 lux (a unit of illumination measurement). Dawn simulators inside individual apartments help soothe residents to a place of serenity in the late afternoon as they prepare to end the day and retire to bed. Another element in the light therapy intervention is the integration of tryptophan into residents’ diets. This amino acid is widely believed to aid in sleep. 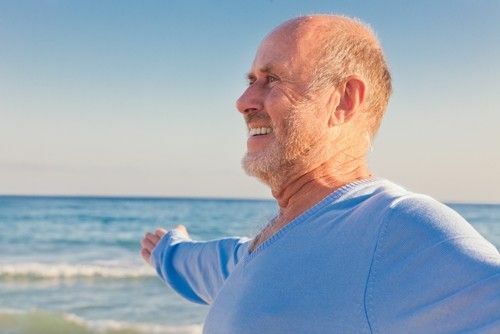 Seniors also get their vitamin D levels checked regularly and receive foods high in vitamin B and omega-3 fatty acids, nutrients generally obtained through contact with sunlight. Life Enhancing Light Therapy can also moderate seasonal affective disorder and depression, other conditions that can lead to sundowning, as well as improving general mood and sleep schedules. In addition, it’s worth noting that preliminary studies on the Life Enhancing Light Therapy showed that the light intervention program worked to improve the quality of life among those who care for people with Alzheimer’s, and happier assisted living staff are better equipped to properly care for seniors with Alzheimer’s and other conditions. As noted earlier, there are plenty of other factors that can lead seniors to become restless in the late afternoon and early evening, and Aegis Living takes these circumstances into account. Residents of Aegis Living communities benefit from the centers’ strong focus on keeping residents hydrated – water dispensers are located throughout the building to ensure seniors have easy access to fluids at all times of the day. This can greatly reduce instances of sundowning caused by unmet physical needs. Additionally, the attentive staff are cognizant of the symptoms of sundowning and trained to detect symptoms of sundowning. That means if your mother is uncomfortable or irritated due to external factors, an Aegis Living staff member will be there to listen to her complaints and work to make her feel relaxed in her surroundings. Another element that can help reduce instances of sundowning is the medical presence at all Aegis Living communities. Doctors make frequent visits to check up on residents, and those who notice signs of sundowning are qualified to conduct exams that determine the cause of sundowning. The physician may find that a specific medication is causing side effects that bring about restlessness, and he or she can alter a senior’s drug regimen to offset those adverse reactions.